Air is often the ideal medium for heat treatment facilities, industrial furnaces and thermal process systems. We offer all three flow configurations – axial, centrifugal and tangential – and a solution that is tailored to your needs. Whatever process you use, LTG fans will optimize your process and the design of your system. 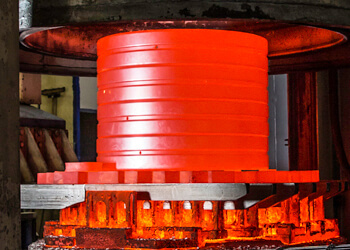 One example is air cooling and hardening of red-hot steel parts after forging: to achieve the required material hardness and strength, it is essential to apply air evenly to all the parts and adhere to the specified cooling curves. LTG tangential fans fulfil these requirements. They generate a perfectly uniform air flow that reaches all parts of the working surface. It is also possible to control the flow zone by zone in order to adhere to the specified cooling curves without using additional equipment like baffle plates, dampers or pressure boxes. In addition, the discharge length can be matched exactly to the machine width. This makes the air flow conditions independent of the total system width. With modular systems you can therefore test the air flow with the smallest version and then transpose the results to larger ones. This considerably simplifies the design and development of model series. 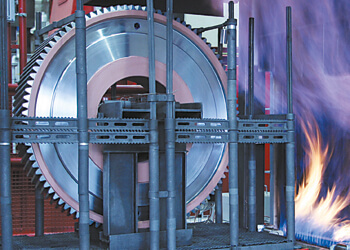 LTG tangential fans are the first choice for these specific applications in thermal process engineering. This is because of their ability to distribute air very evenly over large areas. They allow you to set up efficient and high-quality thermal processes at low cost. 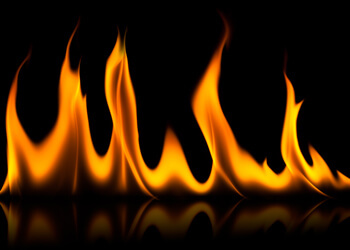 Ask us about our high-temperature versions (up to 800°C), which we supply in many sizes. LTG offers a special range of combustion air centrifugal fans for gas burners, which are widely used in thermal process engineering. These are distinguished by their robust design, low noise emissions and high efficiency. Their flat characteristic curves are ideal for modulating burner systems. Finally, LTG's fan range includes highly efficient axial fans. These are ideal for large air quantities. Discover LTG's products for thermal process engineering! Click here for more product Information. We have worked with customers in thermal process engineering for many years now, and supply fans for industrial furnaces and other thermal processing facilities. These include foundries, hardening shops and production facilities for brake pads, to give only a few examples.